Tornado’s Air Services flys our guests into our outpost camps, Smoky Lake Lodge, Portage Lake Lodge, Straight Lake Outpost, and Sinclair Lake Outpost from our base in Port Loring on the Pickerel River. 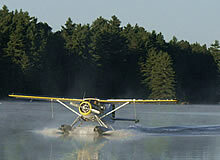 We can also fly you from a water-based location of your choosing to one of our camps. Call for pricing and availability.